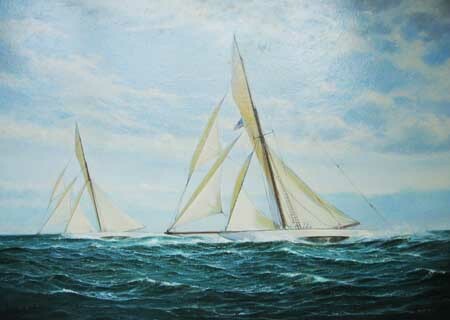 Defender is Nathanael Greene Herreshoff's second victorious defender. The boat is designed in the utmost secrecy and her construction shrouded in mystery. No one was allowed to enter the yard, especially not press or photographers. In building Defender, the Herreshoff brothers' special innovation is the use of Aluminum. But, just after the boat is launched, is becomes evident that is suffers from a little known phenomenon: corrosion due to electrolysis. This type of construction allowed a weight saving of 17 tonnes over classical building methods. During the defence selection trials, Defender sails against Vigilant, Volunteer and Jubilee. During the final, only Vigilant (1893) skippered Charlie Barr races against Defender. On August 10 Vigilant notches up a win. Defender does not finish due to rig problems. Defender strikes back on August 29 and 30 with two easy wins against Vigilant and is selected to defend the America's Cup against the British yacht Valkyrie III. The first one: 15 miles to windward off Scotland Lightship and return. The third one: 15 miles to leeward and return from Sandy Hook Lightship.